Learning is fun when you're at ski school at one of Aspen/Snowmass’s four mountains – Snowmass, Aspen, Aspen Highlands and Buttermilk. For many Owners and families at Dancing Bear Aspen and The Timbers Club, heading "back to school" can be the highlight of any ski trip. Whatever your age or ability, Aspen/Snowmass (which is run by the Aspen Skiing Company) has a program that will fit the bill. Lots of families at The Timbers Club in Snowmass favor that ski area for its convenient ski-in/ski-out access. Parents can cruise with their kids right over to the Treehouse Adventure Center at Snowmass Base Village. 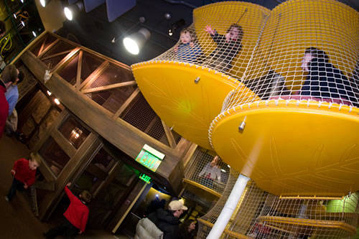 In addition to being a meeting place, this unique facility is home to a climbing gym, themed play rooms, stores, rental equipment and family entertainment. Kids as young as two-and-a-half can start getting the hang of skis in a private learning area, while older kids will zoom all over the mountain. They’ll have so much fun on race courses, in terrain parks and making new friends that they may not notice how much they’re learning along the way. Daredevil teens can even sign up for a three-day park & pipe camp and learn to ride boxes and rails in a Buttermilk park so cool that it’s the home of the Winter X Games. Aspen Mountain (aka Ajax, so named from its former days as a silver mining mecca) is famous for its black-diamond terrain, so skilled skiers love staying at Dancing Bear Aspen close to the action. Owners often head out for the day with their favorite Diamond Pro instructor for a full-day of private instruction. The Diamond Pros are the country’s only private affiliation of ski pros and are available exclusively at Aspen/Snowmass. Each Pro is trained and overseen by Weems Westfeldt, the former Director of Operation for Ski & Snowboard Schools of Aspen/Snowmass. Westfeldt now focuses exclusively on providing the very best private instructors who are exceptionally equipped at getting skiers of all levels to master new skills. There are no pop quizzes or homework at ski school –- just plenty of fun tearing up the mountain. Reach out to the Aspen/Snowmass Ski & Snowboard Schools for more information. See you on the slopes! Learn more about Timbers Resorts and where the best slopes are for your family, by contacting us via email at info@timbersresorts.com or by phone, 888.366.6641.